Come on out, Rochester! :) Hope to see you there! Click HERE for more info. Don't forget, I'm always willing to make a custom, extra special monster for you! All you have to do is ask! Also, I have a few shows coming up at the end of the month. Here's some information and the rest of the details are under the WHERE TO BUY tab up top. One Week Away: Indie Garage Sale [Utica, NY]!!! UUCB Holiday Show. Details about that show here! I'm a few days late [I've been busy!] but I wanted to say thank you to everyone who came to support erinmakesstuff at Buffalo Women's Gifts this past weekend. It was an AWESOME show. I loved it last year and was excited to be accepted back. This year was even better than last. So many monsters found homes and I pretty much sold out of ornaments! Here are some pictures of what was there. There are two shows left this season: The annual UUCB Holiday Show in Buffalo, NY on Dec. 10 and the Indie Garage Sale in Utica, NY Dec. 10-11. I need to get knitting! Hi everyone! I just got back from an awesome show [Mayday Underground Arts + Crafts Show] at the Main Street Armory in Rochester! It was really fun introducing my monsters to another city and finding new fans. A big thank you to the lovely ladies who organized the show [I'll definitely be applying again for the spring!] And you know what else is cool? 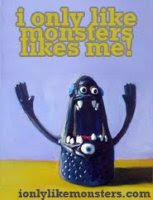 My monsters were pictured in City Newspaper! Here's a screenshot of their website. So what's next? Next Sunday is the Art Garage Sale at Lovin' Cup in Henrietta, NY. The weekend after that is one of my FAVORITE shows: Women's Gifts! Check the "Where to Buy" tab at the top of this page for more details on those two shows... and all upcoming events. Thanks for stopping by! Just a quick post to tell you that I've added a few new events for the upcoming fall/holiday season. One is even in ROCHESTER! :) Check the events tab every so often because hopefully there will be two more added soon! Here's some pictures from my monsterful table last weekend! There were a lot of great artists at the show, but I was super impressed by Elizabeth Strong's Lizard Breath Beads. I loved them! Each piece of jewelry is so colorful and cool. She also has an etsy shop so you can buy some of her fabulous pieces! And here are some pictures of the table full of monsters I had yesterday... Including Andrea's kitty ball monsters! Enjoy!